The Chief of the Naval Staff, Admiral Sunil Lanba, is proceeding on an official tour to Indonesia from 09-13 August 2016. The visit aims to consolidate existing Maritime Cooperation initiatives with Indonesia as well as explore new avenues in accordance with India’s ‘Act East Policy’. 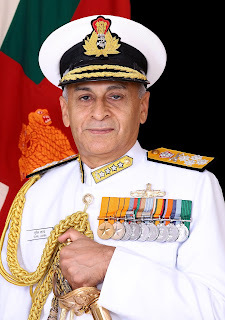 During the visit Admiral S Lanba is scheduled to hold discussions with the Indonesian Defence Minister, Chief of Defence Forces, Chief of Indonesian Navy, besides other Senior Dignitaries and Naval Officers. India and Indonesia have historical linkages which date back centuries. In the modern era, India and Indonesia have been co-founders of the Non Aligned Movement besides mutually beneficial collaborations in multilateral forums such as, ARF, ADMM+, G20, WTO etc. Defence co-operation between India and Indonesia is robust and has seen ascendency through regular ships, aircraft and military delegation visits, training exchanges etc. Both countries had also signed the Defence Cooperation Agreement in 2001. Indonesia have adjoining Maritime Search and Rescue regions and Exclusive Economic Zones and share similar maritime challenges such as long coastline, extensive EEZ, coastal security, large coastal shipping and fishing fleet, wherein both navies have opportunities to learn from each other’s experiences. In addition, common ground exists for cooperation on a number of issues common to both navies. IONS- With shared maritime boundary, Maritime Cooperation between the Indian and Indonesian navies has been robust and one of the strong pillars of bilateral Defence cooperation. Indian Navy and Indonesian Navy are partners in the Indian Ocean Naval Symposium (IONS), a maritime cooperation construct conceptualised and pioneered by Indian Navy in 2008. Both countries have been conducting Coordinated Patrols along the International Maritime Boundary Line (IMBL) since 2002 and 27 editions of coordinated patrols have been completed till date. Both countries had also conducted the first Bilateral Maritime Exercise in Oct 2015. Warships of both countries visit each other’s ports regularly. Staff Talks and IFR 2016- Both navies also engage in Navy to Navy Staff Talks which commenced in 2007. The 8th round of staff talks are scheduled to be held in 2017. Indonesian Navy was one of the first countries to confirm their participation in the International Fleet Review 2016 held at Visakhapatnam and participated in the review with a Ship. The Chief of the Indonesian Navy Admiral Ade Supandi also attended the Review and held bilateral discussions with the Chief of Naval Staff. Indian Navy too participated in the International Fleet Review conducted by the Indonesian Navy in Apr 2016 as well as the Multilateral Exercise Komodo (MNEK) conducted by the Indonesian Navy. Admiral’s Cup at INA- The Indonesian Navy for the first time participated in the Admiral’s Cup Sailing Regatta conducted by the Indian Navy in 2015 at Indian Naval Academy, Ezhimala from 03-13 December 2015.